I want to thank you all for the tremendous support that you showed me after the burglary last week. The Microscope’s readers have grown into the tens of thousands in the last month, and the encouragement was overwhelming. Also, a special thank-you to those who proposed a donation drive to buy me a new laptop; as it turned out, it wasn’t necessary this time. But if you’d like to support me in what I do here, you might want to consider checking out my novel, LAZARUS, which is repeatedly and crazily advertised under every comic (including this one). Less than a week later, the comics rise again. That is the Microscope’s answer to the burglars. My sci-fi thriller, LAZARUS, is out on both Smashwords and Amazon! This is what I was talking about above. Readers like it. You might too. 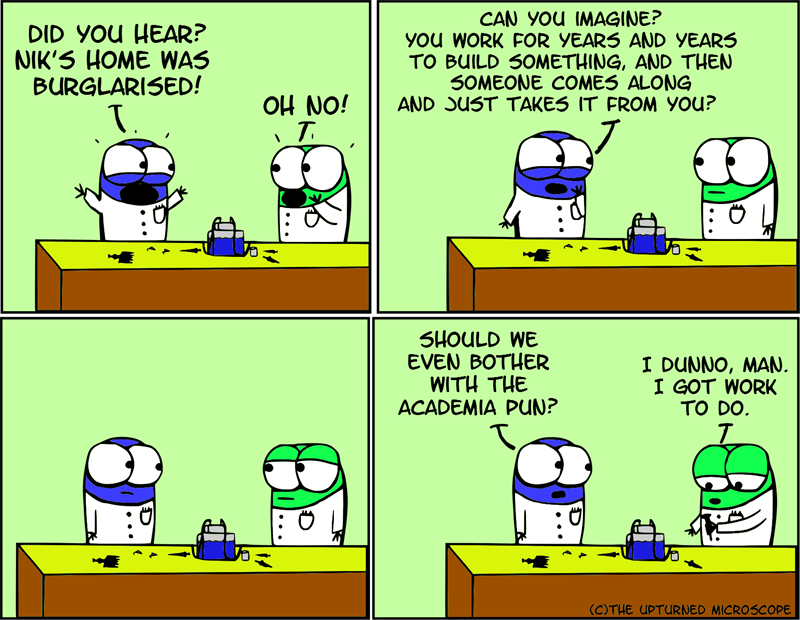 This comic was posted in Comics, Humour and tagged academia, comic, Humour, lab, PhD, postdoc, research, science, science career, science humour, webcomic.